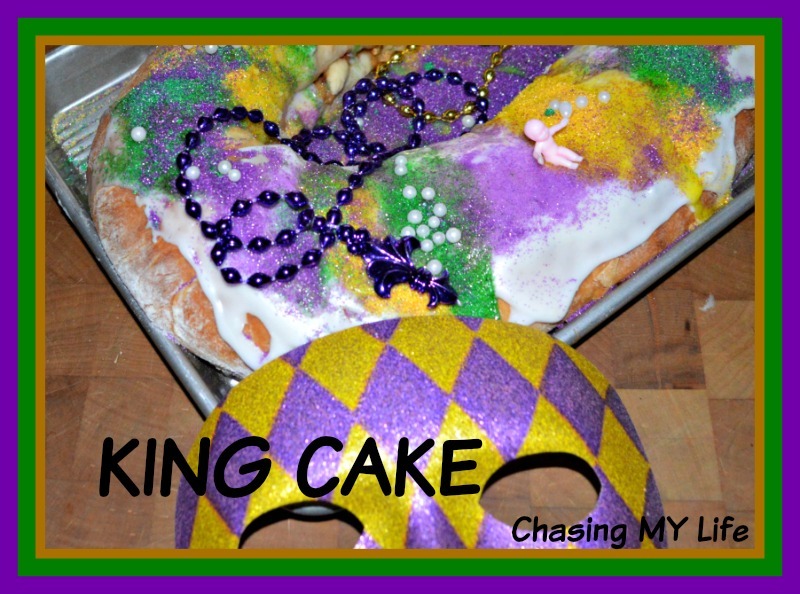 So Mardi Gras ends Tuesday and I thought this would be a good time to run this recipe for Mardis Gras King Cake. I threw in some history for you also since King Cake isn’t just for Mardi Gras though that is what it is most famous for these days. I do have to admit I made this cake a few years back when we were living in Texas during Mardi Gras season though since then I have made it for Epiphany without the Mardi Gras colors and using traditional Christmas colors. A king cake (sometimes rendered as kingcake, kings’ cake, king’s cake, or three kings cake) is a type of cake associated with the festival of Epiphany in the Christmas season in a number of countries, and in other places with Mardi Gras and Carnival. The “king cake” takes its name from the biblical three kings. Catholic tradition states that their journey to Bethlehem took twelve days (the Twelve Days of Christmas), and that they arrived to honor the Christ Child on Epiphany. The season for king cake extends from the end of the Twelve Days of Christmas (Twelfth Night and Epiphany Day), through to Mardi Gras day. Some organizations or groups of friends may have “king cake parties” every week through the Carnival season. Related culinary traditions are the tortell of Catalonia, the gâteau des Rois in Provence or the galette des Rois in the northern half of France, and the Greek and Cypriot vasilopita. The galette des Rois is made with puff pastry and frangipane (while the gâteau des Rois is made with brioche and candied fruits). A little bean was traditionally hidden in it, a custom taken from the Saturnalia in the Roman Empire: the one who stumbled upon the bean was called “king of the feast.” In the galette des Rois, since 1870 the beans have been replaced first by porcelain and, now by plastic figurines; while the gâteau des Rois Also known as “Rosca de Reyes” in Mexico. In the southern United States, the tradition was brought to the area by colonists from France and Spain and it is associated with Carnival, which is celebrated in the Gulf Coast region, centered on New Orleans, but ranging from the Florida Panhandle to East Texas. King cake parties in New Orleans are documented back to the eighteenth century. The king cake of the New Orleans Mardi Gras tradition comes in a number of styles. The most simple, said to be the most traditional, is a ring of twisted bread similar to that used in brioche topped with icing or sugar, usually colored purple, green, and gold (the traditional Carnival colors) with food coloring. Cajun king cakes are traditionally deep-fat-fried as a doughnut would be, and there are many variants, some with a filling, the most common being cream cheese and praline. It has become customary in the New Orleans culture that whoever finds the trinket must provide the next king cake or host the next Mardi Gras party. Some say that French settlers brought the custom to Louisiana in the 18th century where it remained associated with the Epiphany until the 19th century when it became a more elaborate Mardi Gras custom. In New Orleans, the first cake of the season is served on January 6. A small ceramic figurine of a baby is hidden inside the cake, by tradition. However now, the tradition is giving way to the baby being supplied and the customer placing the baby were ever they wish in the cake. Whoever finds the baby is allowed to choose a mock court and host the next King Cake party the following week (weekly cake parties were held until Mardi Gras). The classic king cake is oval-shaped, like the pattern of a racetrack. The dough is basic coffee-cake dough, sometimes laced with cinnamon, sometimes just plain. The dough is rolled out into a long tubular shape (not unlike a thin po-boy), then shaped into an oval. The ends are twisted together to complete the shape (HINT: if you want to find the piece with the baby, look for the twist in the oval where the two ends of the dough meet. That’s where the baby is usually inserted.) The baby hidden in the cake speaks to the fact that the three Kings had a difficult time finding the Christ Child and of the fine gifts they brought. The cake is then baked, and decorated when it comes out. The classic decoration is simple granulated sugar, colored purple, green, and gold for the colors of Carnival. King cakes have gotten more and more fancy over the years, so now bakeries offer iced versions where there’s classic white coffee cake glaze on the cake before it’s decorated, and even king cakes filled with apple, cherry, cream cheese, or other kinds of coffee-cake fillings. King cakes are available at bakeries all over South Louisiana, but only after January 6 through Mardi Gras Day. Mardi Gras is French for “Fat Tuesday” referring to the practice of the last night of eating richer, fatty foods before the ritual fasting of the Lenten season, which starts on Ash Wednesday. Popular practices also include wearing masks and costumes, overturning most social conventions, dancing, sports competitions, parades and such. Similar expressions to Mardi Gras appear in other European languages sharing the Christian tradition. In English, the day is called Shrove Tuesday, associated with the religious requirement for confession before Lent begins. This is my version of this yummy yeast bread/cake. Scald milk, remove from heat and stir in 1/4 cup of the butter. Allow mixture to cool to room temperature. In a large bowl, dissolve yeast in the warm water with 1 tablespoon of the white sugar. Let stand until creamy, about 10 minutes. When yeast mixture is bubbly, add the cooled milk mixture. Stir in the remaining white sugar, salt and nutmeg. Beat the flour into the milk/egg mixture 1 cup at a time. When the dough has pulled together, turn it out onto a lightly floured surface and knead until smooth and elastic, about 8 to 10 minutes. Cover with a damp cloth or plastic wrap and let rise in a warm place until doubled in volume, about 2 hours. When risen, punch down and divide dough in half. Grease 2 cookie sheets or line with SILPATS or parchment paper. In a large mixing bowl combine the brown sugar, ground cinnamon, chopped pecans, 1/2 cup flour and 1/2 cup raisins. Pour 1/2 cup melted butter over the cinnamon mixture and mix until crumbly. Roll dough halves out into large rectangles (approximately 10×16 inches). Sprinkle the filling evenly over the dough and roll up each half tightly like a jelly roll, beginning at the wide side. Bring the ends of each roll together to form 2 oval shaped rings. Place each ring on a prepared cookie sheet. With sharp knife make cuts 1/3 of the way through the rings at 1 inch intervals. Let rise in a warm spot until doubled in size, about 45 minutes. Push the doll into the bottom of the cake. Frost while warm with the glaze.